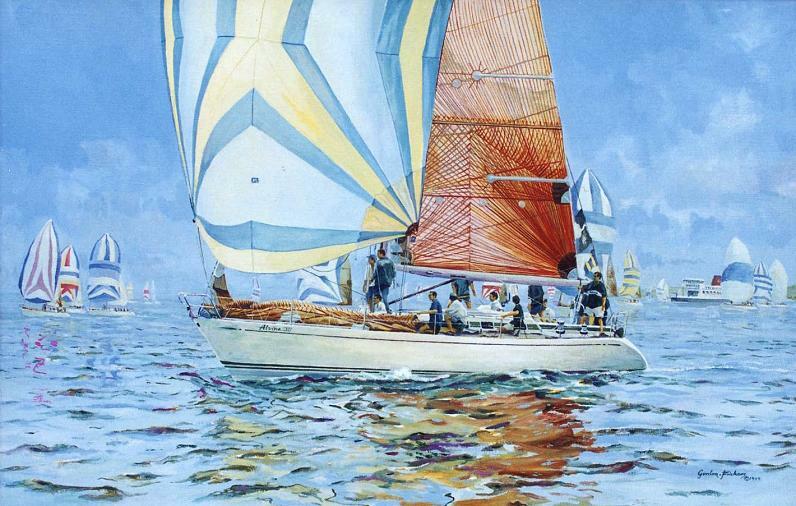 By Gordon Frickers 50 x 81 cms (20″ x 32″), Oils, original commissioned by Yachting World as their first prize at the Rolex Swan European Regatta. Commissioned by Yachting World as part of their first prize for the Rolex Swan European Regatta Yachting World Race. I made a water colour, produced on the day, of the winning yacht which on that particular year was ‘Alvine XII‘; painted, mounted, framed and presented on the day at the prize giving at the Royal Yacht Squadron. 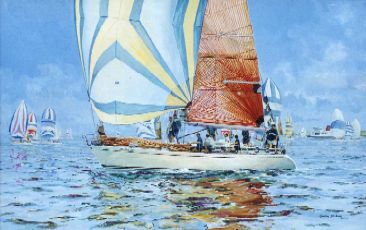 This oil painting shows the winning yacht and was presented later as the ‘main prize’, by the editor of Yachting World, Mr Andrew Bray, to the owner of ‘Alvine XII’ at the London International Boat Show.